User Dusksage has provided a link for the panel where they talk about it. nWoD Fera or something a little more aberrant? Last edited by Egg; 08-20-2014, 09:35 AM. To quote Dave Brookshaw, and possibly the description of the book, "Within every one of us lies the potential of the Beast. Unleash savage powers, answer the call to your Lair, and become the thing that Heroes fear. Onyx Path's new nWoD game line for 2015. 320 pages. PDF/PoD/Prestige Edition." Sounds like we'll get more answers at the nWoD talk tomorrow. I'm imagining a sort of Jekyll + Hyde/Dragon/Incredible Hulk dealio. Ideally there'll be some options for being a ravening monster and not five ways to be a monster who's sad about being a monster. It looks to be something with some versatility. I could see a creature of the black lagoon monster from what little we've seen, snatching people off the beach and taking them back to their lairs. Clearly it's Grendel: The Mommy Issues. If I had to guess from the quoted description, I'd hazard aesthetics dancing between dragons, swamp things and cthulhus, with themes taking from ogres, Grendel, Leatherface and C.H.U.D.s. But there is a lot yet unrevealed and it's very early to make too many guesses. Could be interesting! Definitely an appropriate direction to move in compared to Descent's relative departure from traditional archetypes. Too early to spoil who pitched Beast? Is the picture in the OP from the panel reveal or just an image you felt was appropriate to the topic at hand? Image in OP is from a Blizzard game, came up when I googled "Old God"
Whaaa! So hyped. This is exactly what I was hoping for. Is it actually called Beast: The Primordial? Or is that just speculation from the description? It's called that, unless Something Awful is trolling. I think Eddy Webb pitched the product. I'm reminded of Ars Magica "Bjornær" and the "heart beast." And taking the idea further to eventually include magical creatures perhaps? I imagine that there will be ideas that encapsulate the idea of the hunt (predator/prey relationship) and parasites and other critters that don't fit in the grand circle (various ecologies in different environments including alien ones). I have this bizarre (but awesome) mashup of Harry and the Hendersons (Dear, 1987) and Troll Hunter (Øvredal, 2010) floating in my head. 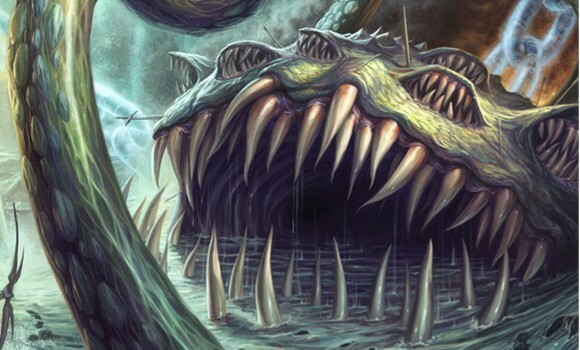 All I know is the fact I want to play a Kraken... now I can see a scene with a party of these things in a diner.